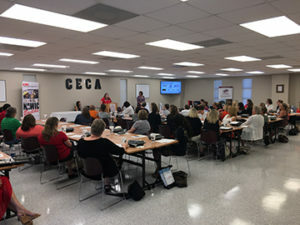 Columbia NAWIC Chapter #113 (sponsoring chapter) members were present and in force to facilitate the Pre-organizational meeting for the chartering of a new Chapter of NAWIC to include Berkeley-Charleston-Dorchester Counties. Chapter #113 members worked tirelessly to coordinate two informational sessions to provide attendees an overview of NAWIC and the benefits of membership. A networking social was also held afterwards to show appreciation to all of our sponsors (Hood Construction, Seamon Whiteside, Waste Management, Haywood Baker, McWaters, Landmark Construction, ESP Associates, Davis & Floyd, Choate Construction, and the Charleston Electrical Contractors). We could not have done this without you! Special thanks to Dove Sifers-Putman (National President-Elect) and @KristeyBoutwellStewart (South Atlantic Regional Director) for making the long trek to the event and for imparting your insight and enthusiasm! Next steps: We need at least 25 women (who work in a construction-related field within the tri-county area) to send in your completed membership applications and dues prior to July 26, 2018, to our Temporary Secretary Marie Myers, Johnson Controls Fire Protection (marie.myers78@aol.com). In the likely event that 25 members are signed up (with applications and paid dues in hand) over the next several weeks, we will then hold an organizational meeting on 7.26.18. Janet Bates, CF Evans Construction, has volunteered her time and talents to serve as the new chapter’s temporary chair. Thanks, Marie Myers and Janet Bates for stepping up and helping us “build” the South Atlantic Region.